Vancouver, BC - Skyharbour Resources Ltd. (TSX-V: SYH) (OTC Grey: SYHBF) (“Skyharbour”) is pleased to announce that the members of the Western Athabasca Syndicate Skyharbour, Athabasca Nuclear Corp. (TSX-V: ASC), Noka Resources Inc. (TSX-V: NX) and Lucky Strike Resources Ltd. (TSX-V: LKY) (“the Syndicate”) have completed large-scale VTEM plus and radiometric geophysical surveys on the Western Athabasca Syndicate Project located near Alpha Minerals’ (TSX-V: AMW) and Fission Uranium’s (TSX-V: FCU) Patterson Lake South (“PLS”) uranium discovery. The original airborne coverage was expanded to provide for the infill and extension of conductive anomalies and structural features identified by a preliminary review of the geophysical data. Based on this initial encouraging data, the Syndicate has elected to immediately commence the second phase of its summer program consisting of follow-up field work and ground-truthing of geophysical targets. A total of 4,840 line kilometres was flown for the VTEM plus time domain survey with an additional 4,400 line kilometres flown for the radiometric survey all of which was on the Syndicate’s Preston Lake Property. The VTEM plus system has been used successfully to locate basement conductors similar to the structures that host the high-grade uranium discoveries at the nearby PLS project. The high resolution radiometric survey was flown to locate uranium boulder trains, in-situ uranium mineralization and alteration associated with uranium mineralization which is what ultimately led to the PLS discovery by Alpha and Fission. Phil Robertshaw (P.Geo., Saskatchewan) is reviewing the collected data and will be providing detailed interpretation of the VTEM plus and radiometric surveys shortly. The areas flown include two blocks in the northern part of the Preston Lake Property. The Preston Lake South block is contiguous with Fission Uranium and NexGen Energy and includes a large area of partially exposed pre-Cambrian shield rocks. The Preston Lake West block claims are contiguous with claims controlled by Aldrin Resources and Forum Uranium. The claims are underlain by Phanerozoic rocks (limestone and sandstone) similar to the PLS discovery area. At Fission and Alpha’s PLS high-grade discovery it is interpreted that the uranium has been mobilized along the fault zones and has been concentrated in the sandstone under the limestone. A review of historic data on the Preston Lake Property has identified a sample collected by the Geological Survey of Canada which returned a value of 5.4 ppm U3O8, considered to be significant in an area with a background uranium value of 1 ppm U3O8. This high U3O8 value may indicate either the down-ice glacial transport of uranium boulders from source or an in-situ source of uranium. For comparison, the highest value down-ice from the PLS discovery is 3.2 ppm U3O8. Management cautions that past results or discoveries on proximate land are not necessarily indicative of the results that may be achieved on the Western Athabasca Syndicate Project. The initial data and results from the airborne surveys have led the Syndicate to expedite the planned summer field program with a number of high-priority targets at the Preston Lake Property being the focus of the work. A sophisticated targeting matrix is being used to further identify and prioritize areas for ground-based follow-up. Field work will include ground-truthing of high-priority geophysical targets using water and soil radon sampling, biogeochemistry, geochemical lake sediment and soil sampling, prospecting, and scintillometer surveying. The Syndicate will employ a systematic, proven and cost-efficient exploration methodology that has led to numerous uranium discoveries in the region and throughout the Athabasca Basin. By the end of this summer’s field program, a total of $1.5 million will be spent in exploration on the project between airborne geophysical surveys and follow-up ground work. The Athabasca Basin of northern Saskatchewan hosts the world’s largest and richest high-grade uranium deposits accounting for just under 20% of global primary uranium supply. Athabasca uranium deposits have grades substantially higher than the world average grade of about 0.1% U3O8. The Patterson Lake area has received escalating exploration attention and claim acquisition activity as a result of the new, shallow discoveries made by Alpha and Fission which includes the recently reported drill interval of 6.26% U3O8 over 49.5 metres in drill hole PLS 13-053. This mineralized zone is located approximately 400 metres to the northeast of discovery hole PLS 12-024 which returned 2.49% U3O8 over 12.5 metres. Consistent high grade, near surface U3O8 assays from Alpha and Fission demonstrate the potential for high grade uranium mineralization on the margins of the western side of the Athabasca Basin. There are still areas in the Athabasca region that are highly prospective and underexplored for high grade uranium as illustrated by Alpha’s and Fission’s recent discovery. 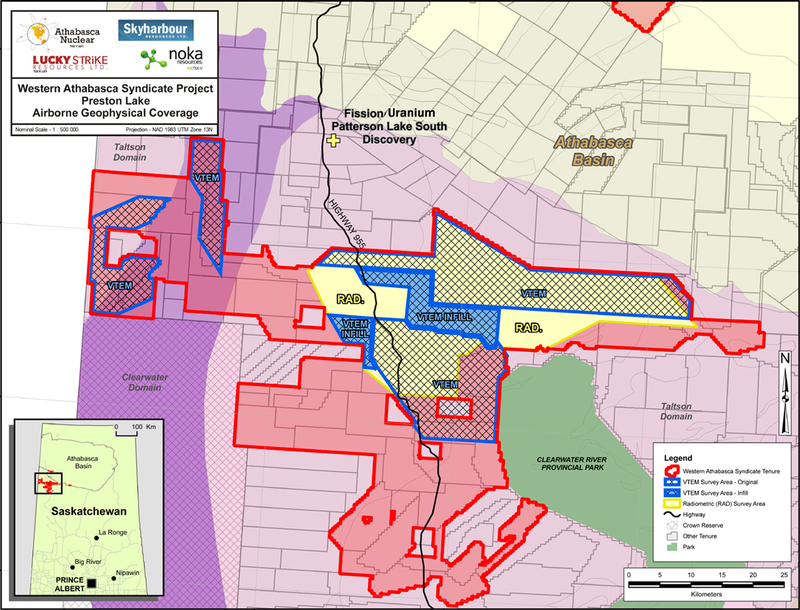 Skyharbour Resources Ltd. is a uranium exploration company and a member of the Western Athabasca Syndicate which controls a large, geologically prospective land package consisting of five properties (709,513 acres) in the Athabasca Basin of Saskatchewan. The Company’s goal is to increase shareholder value through new discoveries and developing exploration projects in geopolitically favourable jurisdictions. The Company has 35.8 million shares outstanding.